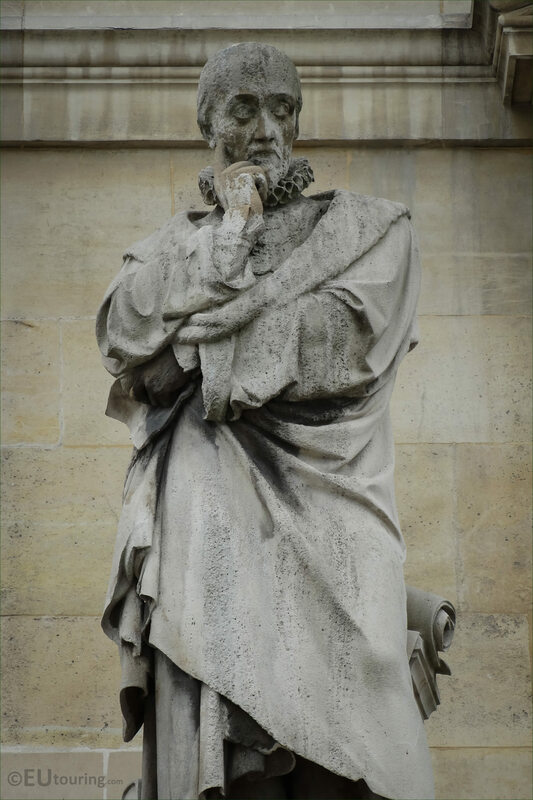 This time while still in the Cour Napoleon courtyard of the Musee du Louvre admiring the Aile Daru wing, we took these high definition photos of a statue dedicated to Michel Eyquem de Montaigne, which was sculpted by Jean Francois Soitoux. 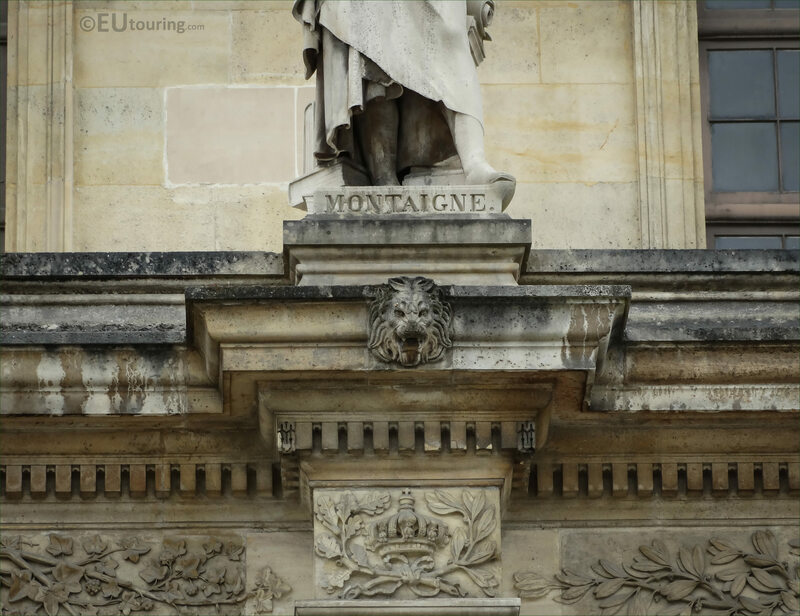 This first photo showing the statue of Montaigne shows that it is located between the windows on the first level balustrade of the Aile Daru facade, and it is the fifth statue from the right hand side, which was put in place in 1857. Now this closer view shows the detail that went into the stone statue, which was produced by Jean Francois Soitoux, who was born in Besancon in 1816, and became a French sculptor, receiving several commissions for statues on the Palais du Louvre in the 1st Arrondissement of Paris, and awarded the Legion of Honour in 1866, then later he passed away in Paris in the May of 1892. And in this last HD photo showing a close up of the plaque at the base of the statue, you can see that it is dedicated to Michel Eyquem de Montaigne, who was born in Aquitaine in 1533 at his parents chateau, and during his lifetime he was recognised as a statesman, being the Mayor of Bordeaux, but died of quinsy at aged 59 within his chateau. 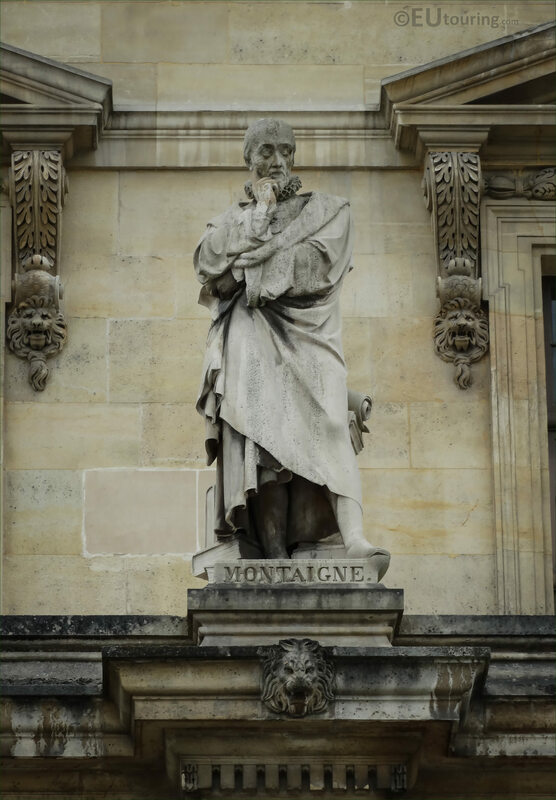 Yet Montaigne was also one of the most significant philosophers of the French Renaissance, known for popularising the essay as a literary genre, with his Essais being published in 1580 and his writings are studied as literature and philosophy around the world even today, plus a psychological topic that he wrote regarding his own views on child education were put into practise and some of these are also still used in education today.